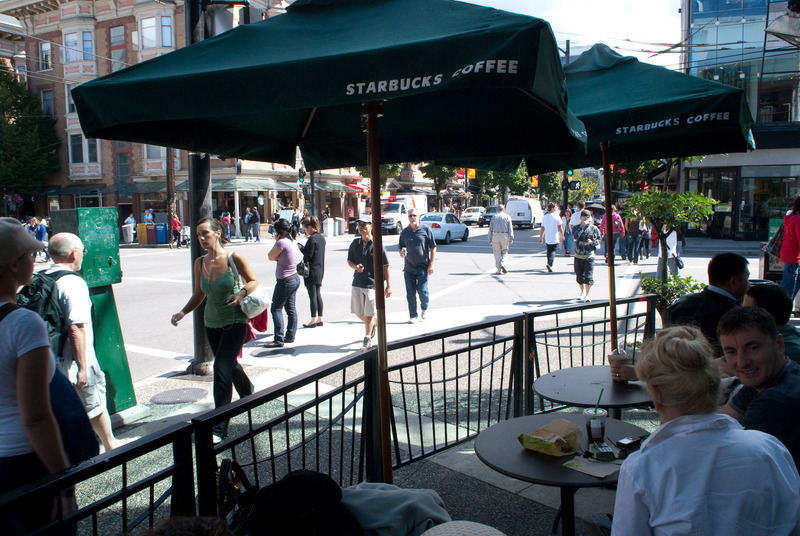 Walking around the ritzy (relatively speaking) area of downtown Vancouver during our recent trip there, I came across a scene that I thought existed only in the world of late-show monologues: a street corner with two Starbucks Coffees. The photo above is horrible, of course, but all I have to show for the slightly-memorable event. You can sort of see the green Starbucks awnings on the building catty-corner across the street. Despite some odd quirks (which I've written about), I like the coffee at Starbucks, but while in Vancouver, we sought out small, local cafes when we could, and were never disappointed. June 7th, 2005 What's the problem with Starbucks? I have seen the same thing (2 Starbucks) in Denver, Colorado as well. I believe that the comedian Lewis Black considers this to be a sign of the Apocalypse. Near the 4th and King Caltrain stop, there’s a Starbucks immediately next to an in-Safeway Starbucks.